Is This How Kylo Ren Got Darth Vader's Helmet in Star Wars: The Force Awakens? Star Wars: The Force Awakens has been in theaters for just over two weeks, and, by now, many fans have surely visited their local theater multiple times to watch this big screen adventure over and over again. One reason for multiple viewings could be to find hidden answers for the several unanswered questions in director J.J. Abrams' blockbuster. As it turns out, one of those questions may have already been answered, in one of the Journey to Star Wars: The Force Awakens book series. Be warned, if you haven't seen Star Wars: The Force Awakens quite yet, there will be MASSIVE SPOILERS below, so read on at your own risk. 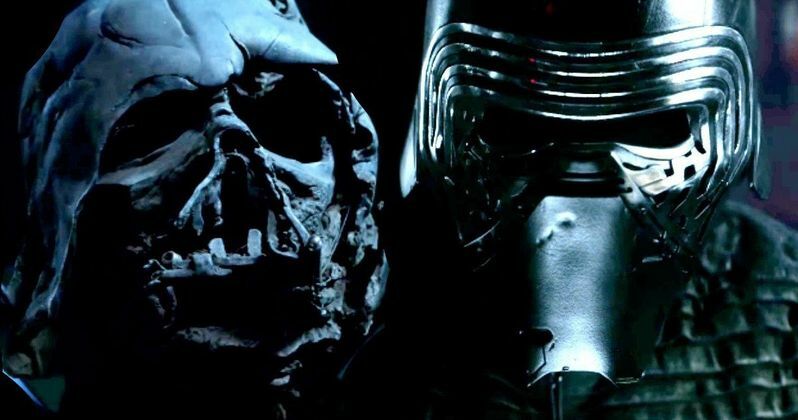 The unanswered question we're referring to revolves around the presence of Darth Vader's burnt helmet, which Kylo Ren is seen talking to in Star Wars: The Force Awakens. The new villain, who we learn later is in fact the grandson of Darth Vader and the son of Han Solo (Harrison Ford) and Leia Organa (Carrie Fisher), is seemingly obsessed with the Sith lord, claiming he'll finish what Vader started. What remains unclear is how Kylo Ren even came into the possession of Darth's helmet. According to Star Wars Minute, the answer lies within a short story released in November, as part of the Journey to Star Wars: The Force Awakens series. The story, entitled The Perfect Weapon by Delilah S. Dawson, centers on Bazine Netal, played by Anna Brewster in Star Wars: The Force Awakens, a character seen in Maz Kanata's bar who tells the First Order about Finn and Rey's whereabouts. In the short story, Bazine is hired by a mysterious person to retrieve a package from an old psychiatric ward, that used to house former Stormtroopers. She finds the package in the room that used to belong to Jor Tribulus, who was a captain at the Battle of Endor shown in Star Wars: Episode VI - Return of the Jedi. The theory is that this package was actually Darth Vader's helmet, and that Bazine's mysterious client is in fact Kylo Ren. The Perfect Weapon story doesn't explicitly state what's inside the package, or that Kylo Ren is Bazine's mystery client, but Star Wars Minute speculates that Jor Tribulus "stumbled upon" Darth Vader's funeral pyre after the Battle of Endor, and decided to take his helmet as a souvenir. It was confirmed before the Journey to Star Wars: The Force Awakens books were released that they would all be part of the official Star Wars canon. Now that Star Wars: The Force Awakens has hit theaters, and we have just over a year and a half until Star Wars: Episode VIII arrives in May 2017, perhaps another short story will be released that confirms this theory. We know that another Star Wars: The Force Awakens mystery will be answered in an upcoming Marvel comic book that is also part of this canonical series. Marvel's C-3PO one-shot comic will be released on February 24, and will reveal the story of why this beloved protocol droid has a mismatched red arm. A passage from the upcoming companion book was released over the weekend, revealing that C-3PO's red arm was a "memento of another droid's sacrifice." While we wait to hear anything official about Kylo Ren's connection to Darth Vader's helmet, take a look at the video below that breaks down this theory in depth.